I’m new to Openhab and have a problem but google and searching forum and documentation hasn’t workd out for me. Maybe it is to simple? My setup: openhabian with usb zwave controller. I already integrated an roller shutter(via paperUI and simple mode) and an led light bulb (via habmin and manual Item configuration). I left the simple mode of paper ui because it created double Item wich i couldn’t delete. Took me long enough to get it cleaned up in the jasonDB. I have an magnetic door sensor “IM-20 Door Sensor”. In the end i want to switch on a lightbulb if the door is opened. First I created an Item as Switch and integrated it as Switch in my sitemap. But then i can toggle it in the sitemap which i don’t want. So i looked again and found the Item type contact which to me looked far better for this since all I want the sensor to signal is door open or door closed. 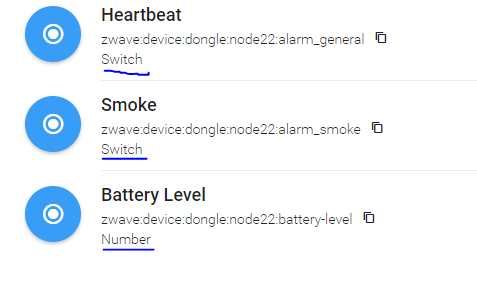 So i connected the “binary Sensor” channel of my thing with the Contact Item and threw it in the sitemap. But in the sitemap i just see the Item on the left side, but no information on the right side (like the on off toggle with the lightbulb). But in paper UI it says “triggered or untriggered” when i open or close the physical sensor. If i close and open PaperUI the first time it just says “-” and after triggering the physical switch it says “triggered or untriggered”. So the Conntact item is not persistent in the system, just when i trigger it? Contact Kabuff_Tuer_Offen "Kabuff Tür offen"
Contact Kabuff_Tuer_Offen "Kabuff Tür offen[%s]"
…well, that gives me a “-” on the right side in my sitemap but it still won’t show me any information in what state my sensor is in. What is frustrating is, that in paper ui i see the state change but i can’t get it to my sitemap. So any other suggestions how to debug this? Change the state to OPEN or CLOSED and you will see it. It is NULL now. No, that does not happen. I think something is wrong with my config, because the only place i see some feedback from the sensor is in paper ui. Here is the logfile. node 5 is my sensor. Any Error i should care about? 2018-02-04 00:09:49.915 [temChannelLinkRemovedEvent] - Link ‘Kabuff_Tuer_Offen => zwave:device:8663531c:node5:sensor_binary’ has been removed. 2018-02-04 00:11:06.714 [.ItemChannelLinkAddedEvent] - Link ‘Kabuff_Tuer_Offen-zwave:device:8663531c:node5:sensor_binary’ has been added. 2018-02-04 00:23:44.703 [temChannelLinkRemovedEvent] - Link ‘Batterie_Kabuff_Tuer => zwave:device:8663531c:node5:battery-level’ has been removed. 2018-02-04 00:23:44.705 [temChannelLinkRemovedEvent] - Link ‘Kabuff_Tuer_Offen => zwave:device:8663531c:node5:sensor_binary’ has been removed. 2018-02-04 00:25:24.486 [.ItemChannelLinkAddedEvent] - Link ‘Kabuff_Tuer_Offen-zwave:device:8663531c:node5:sensor_binary’ has been added. 2018-02-04 00:25:24.504 [.ItemChannelLinkAddedEvent] - Link ‘Batterie_Kabuff_Tuer-zwave:device:8663531c:node5:battery-level’ has been added. First I created an Item as Switch and integrated it as Switch in my sitemap. But then i can toggle it in the sitemap which i don’t want. You are looking at the Thing, not the Item I suspect. When you look at the Thing that represents this sensor in PaperUI, it will tell you what type of Item you must use to link that channel to an Item. I suspect you must use a Switch. So the Conntact item is not persistent in the system, just when i trigger it? It is not clear to me what you are looking at so it is hard to answer. Item states are presistant in the system until you change a .items file or restart OH. At that point the Items get initialized to NULL (which will appear in your sitemap as “-”. PaperUI is an administration UI so it doesn’t really let you control or show Items in general. Please How to use code fences when posting logs. For what it’s worth… I had the same problem. Saw the status in paperUI and habpanel, not in the sitemap.